Charles McCallon Alexander (1867-1920) was an American evangelistic gospel song leader and soul winner, who during his life was associated with M. B. Williams, R. A. Torrey, and J. Wilbur Chapman. 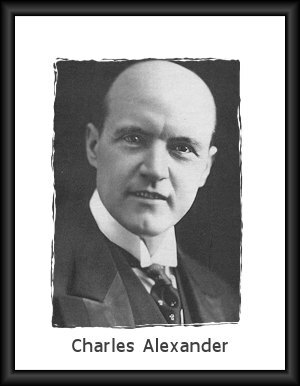 Charles M. Alexander: the Persuasive Personal Worker. Charles Alexander: From Farm to Famous Gospel Singer. Short biography. The Personal Side of Mr. Alexander. Short biography. Helen Cadbury Alexander (1877-1969): Married Charlie Alexander July, 1904. Started the Pocket Testament League in 1893. With J. Kennedy Maclean, wrote Charles M. Alexander: A Romance of Song and Soul-winning, published in 1921? Wrote the words for vs.3 and 4 of the hymn "Anywhere with Jesus."